Astronomy isn’t just for the nighttime. There’s one star you can see during the day…the sun. Just a month ago (March 20th) the sun came up exactly due east and set due west. And it will do that again in December. We usually think of the sun rising in the east and setting in the west but if you want to be particular, it only happens during the time of year when we have equal daylight and equal night. Yep. The rest of the year the sun rises a little more to the east or a little more to the west and sets that way as well. What else happens during the day for astronomy? You can see Venus. It’s easier with binoculars, much easier. Try to find a pinpoint of light in the sky. Pretty darn hard because the sky is so bright. But Venus is always close to the sun. When the sun goes down, Venus goes down with it but you might still see Venus in the early evening before it disappears but right now Venus goes down before the sun. To find Venus in the daytime you probably want to get an idea where to look. 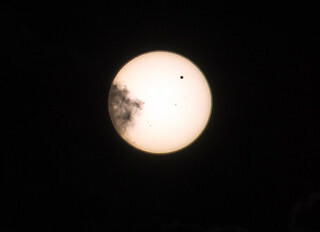 Here’s a website where you can check Venus’s position which is to the right of the sun right now (http://neave.com/planetarium/). Grab a pair of binoculars and take 10 minutes or so to find it. Don’t look at the sun. And if Venus is ever very very near the sun, this wouldn’t be a good idea. But if you find Venus, great job! Then put your binoculars down and see if you can find it with just your bare eyes. What else is out there? If you want to try and find Jupiter or even other objects and you have some patience and a good set of binoculars or a telescope, you can see those and even the space station. See below for a few pics of those. What I find most fascinating during the daytime is what the sun spots look like. You need a solar filter over your binoculars or telescope. You can buy that on ebay or amazon or a few other places pretty cheaply. You could also confirm that the sun rotates by watching the sunspots move. Yep, the sun rotates just like everything else. As an aside, everything is moving, everything. Even if you feel like you’re standing still…you are on the earth which is moving, you’re just not moving relative to the earth…like being on a plane. You’re moving but not relative to the plane. Oh, can’t forget seeing the moon during the daytime. A thought about the moon, when it’s a full moon, it’s opposite the sun so the full moon is in the east when the sun sets or it’s in the west when the sun rises. When it’s a new moon or old moon, it’s near the sun in a crescent shape. And a new moon crescent is lit on the west side and an old moon looks like a C, lit on the east side. Get your binoculars out and see if you can find Venus. It seems like I’m hearing more and more patients describe light streaks occurring in their eyes. It could just be chance though. The way they describe these effects pretty much tells me what’s happening (helps me diagnose) and rarely is it anything serious (there are other vascular problems that could cause strange vision problems like a TIA). What patients are telling me about is their ophthalmic migraines whether the patient knew what it was or not. The strange thing is we usually think of the word migraine as causing pain in our head but the eye doesn’t have any pain when this happens. It’s interesting that the cause of this visual phenomenon is thought to be the same cause as the headache type migraine…a vascular fluctuation. But there are other conditions that can cause light to seem to be inside the eye and not outside. There’s one called a pressure phosphene. You can create these on your own anytime you want. Just press on your eye. It’s easiest to press on the temporal side and then notice the dark circular spot that appears in the nasal part of your vision but it works both ways. That effect has even been used to estimate the intraocular eye pressure and there’s even a simple instrument that is made to do that but it’s accuracy is questionable. You can do this with your eyes open or closed. You can also rub your eyes and get other visual patterns. What’s happening is the photoreceptors are being stimulated, not by light, but by mechanical pressure which then makes those photoreceptors send a signal to your brain as if there was light, or at least an interesting visual pattern…not like a flashlight kind of light. There’s also a certain area above the atmosphere where the astronauts orbit called the South Atlantic Anomaly. When they reach that area they get more cosmic radiation compared to the rest of the orbit apparently due to a change in the magnetic field surrounding the earth. Of course this radiation is being studied but one of the odd ones is with the Phantom Torso and before that there was the the Apollo Light Flash Moving Emulsion Detector (ALFMED). If you see flashes of light yourself, the likelihood of it being innocuous (harmless) is pretty good. But then, there’s a small chance it’s a retinal problem that needs to be treated which is why patients with any complaint of flashes should be dilated to rule out the bad stuff.